Karina's Kreations: Stampin'Up Bird Banter Stamp set of the Month! 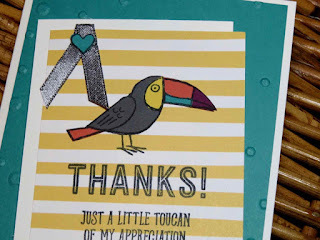 Stampin'Up Bird Banter Stamp set of the Month! I offer a class in the mail once a month called stamp set of the month. I send three card kits or finished cards and the stamp set in the mail to you for $30.95. The stamp sets vary in price. I also provide all the dimensions and the card instructions for the cards. This month the stamp set is bird banter and this is one of the cards. I was inspired by the paper piercing technique shown by Brian King at Onstage in Salt Lake city. 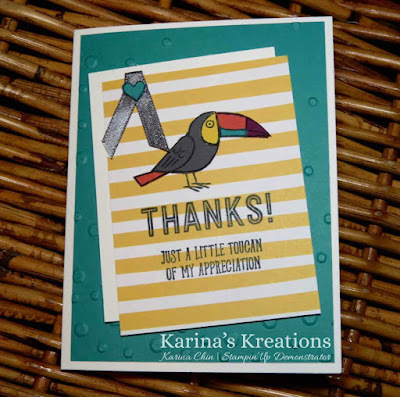 I stamped my greeting on the tutti-fruitti 6" x6" designer series paper and used the scattered the sequin embossing folder on the Bermuda Bay card stock.